Lisa Hoffman Beauty fragrance and perfume list. Lisa Hoffman embraces every facet of life into her creative process, from the everyday to the adventurous. As a working professional, entrepreneur, wife, and mother, she balances the daily responsibilities which are familiar to every woman. And as an avid world-traveler, fresh insights gathered from afar inspire innovation. A discovery experienced on the journey often reveals itself as the answer to a challenge she meets back at her drawing board. 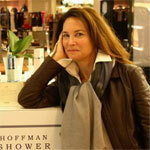 Lisa's approach frees women to enjoy fragrance in uncomplicated ways. Her understanding of the fragrance-wearer is reflected in the modern sensibility of her fragrance collections.